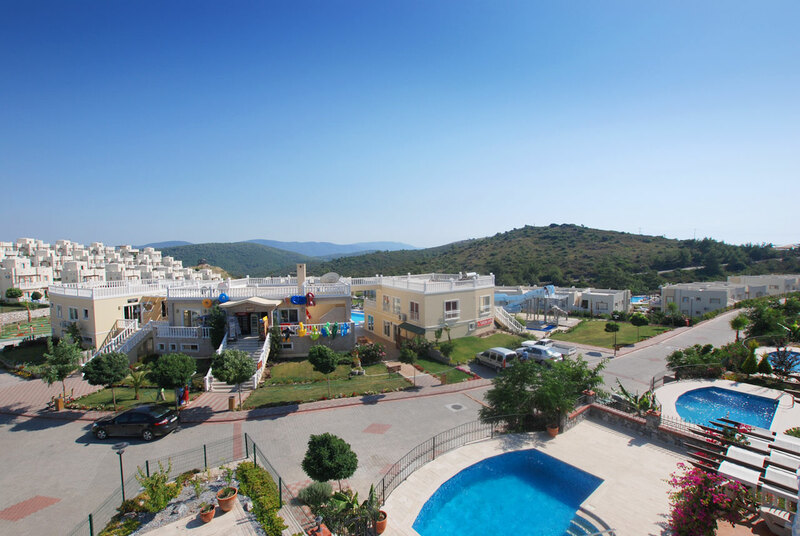 The Turquoise Resort in Lake Tuzla is located in one of the most beautiful locations in Turkey. The resort sits on a hillside that commands stunning views across Lake Tuzla and its shimmering waters. Lake Tuzla is surrounded by green mountains that are abundant with Pine trees and Olive Groves. The Lake itself is home to many exotic and interesting birds such as Herons, Cormorants, Ospreys, Flamingos, Pelicans and many more. Lake Tuzla is part of the Aegean Region of Turkey that is predominantly made up of coastal towns and villages that make their living from tourism and the stunning Aegean Sea whilst the internal landscape provides a backdrop of Mountains and green Forests. The nearest major city is the cosmopolitan Bodrum which is just 20 minutes away. 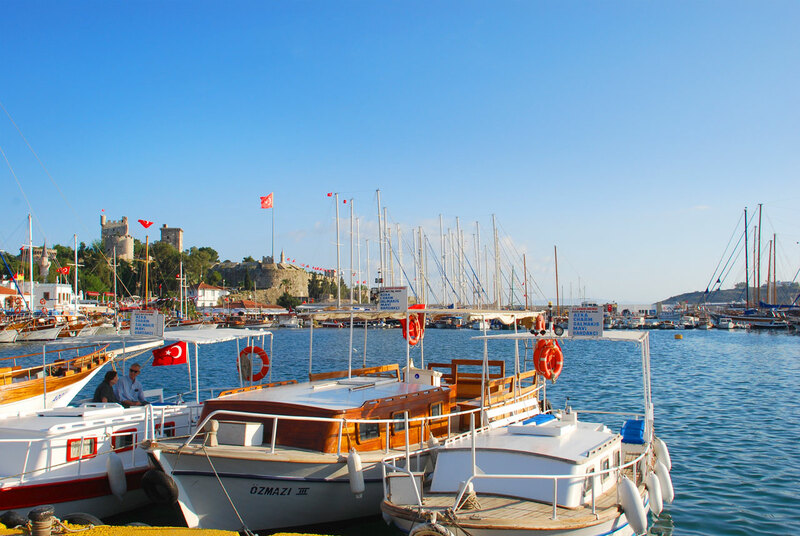 Bodrum has every amenity and activity you could ask for and is steeped in culture and history. 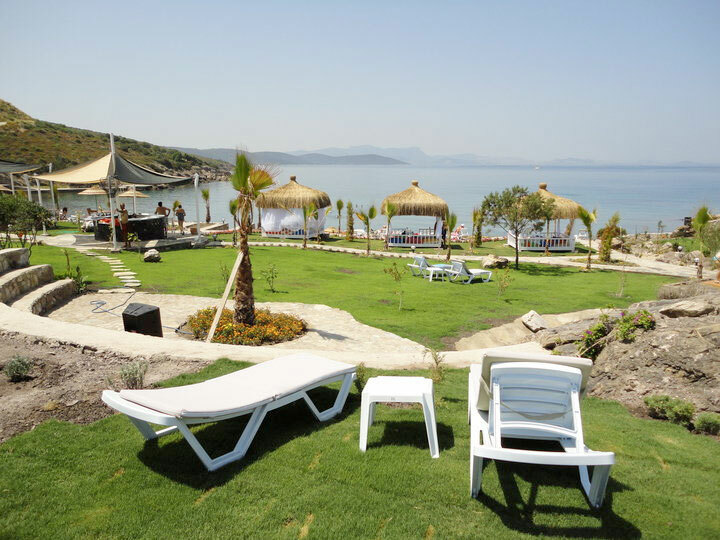 The nearest airport to the Turquoise Resort is the Bodrum Milas airport which is 16km and approximately 15 minutes away. There are always taxis at the airport and these cost around 60 to 65 Turkish Lira for a one way trip although we recommend you organise your airport transfers prior to arrival. Turquoise Resort is perfectly located for many of the nearby coastal villages and towns which offer superb restaurants and hidden beaches such as Guvercinlik, Bogazici and many others. 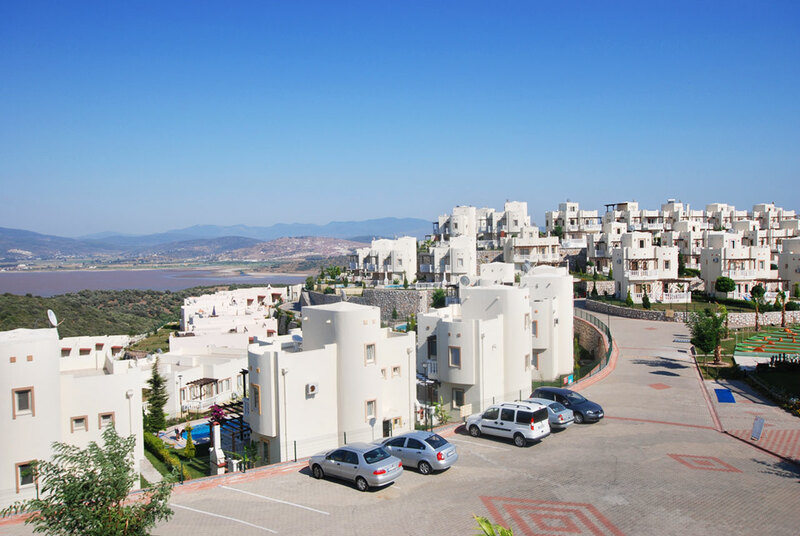 Turquoise Resort, Lake Tuzla was built by the Turkish building company Artev who also built the neighbouring sister resorts of Flamingo Country Club, Royal Heights and Lakeside Gardens. The resort has 100 villas and 350 Apartments. 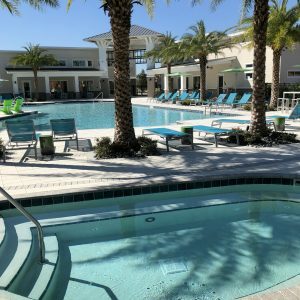 The Turquoise Resort villas range from 2, 3 and 4 bed villas the majority of which have private pools whilst all the Turquoise Resort apartments are either ground or first floor 2 bedroom properties with access to individual communal pools. Due to the position of the resort which runs along the hillside overlooking the Lake virtually all the properties command stunning views. 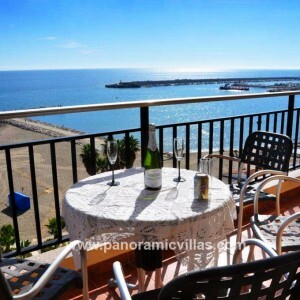 Those villas and apartments with roof terraces have the perfect place to sit and drink in the Vista. 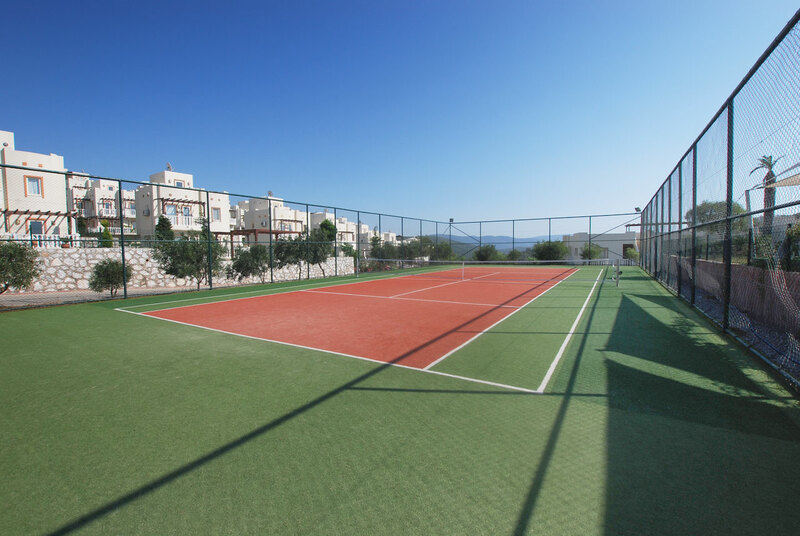 The resort has a plentiful supply of Amenities and Activities to keep absolutely everyone happy. 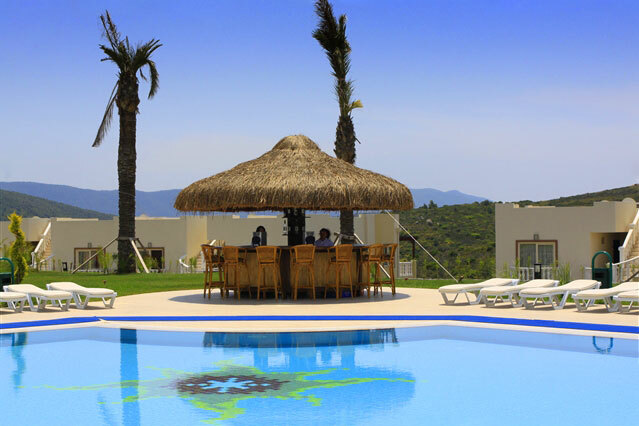 There are 7 communal pools including a very impressive Infinity pool by the main restaurant and bar. There are plenty of sun loungers to go around ensuring you sun bathe in comfort. 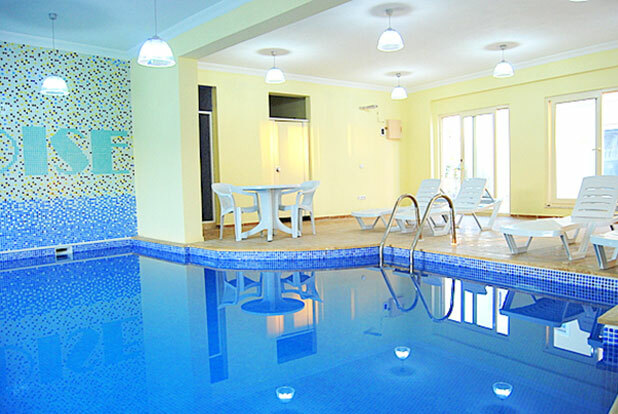 There is also a heated indoor swimming pool. 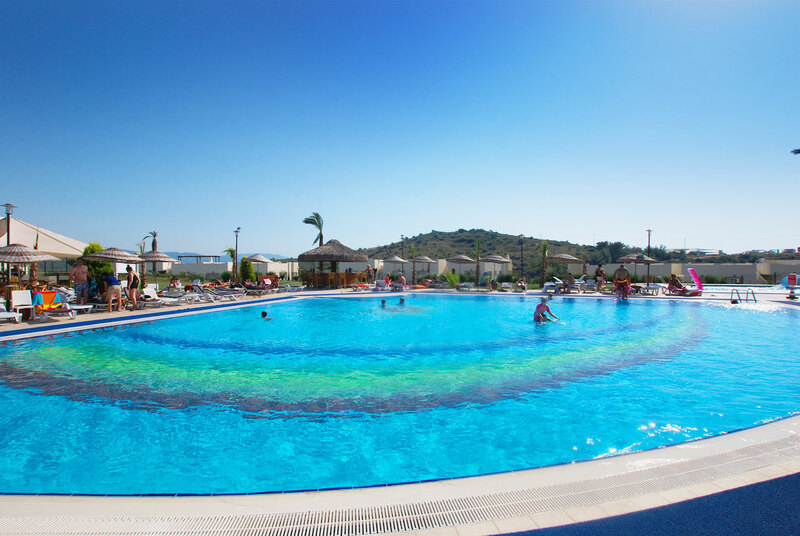 The main pool has 2 water slides which are perfect for keeping the kids entertained whilst you sit back with a drink from the pool bar. The main restaurant and bar area has a fantastic open terrace and is the perfect spot to take your afternoon lunch or evening meal. The newly refurbished Leaf Restaurant serves a host of international cuisines including Chinese, Indian, Turkish and specialise in fish dishes. Lunch time snacks are covered with an array of Pastas and Pizzas, whilst the breakfast menu leaves you spoilt for choice. The prices are fair and an evening meal for four with drinks can cost between £35 and £45. 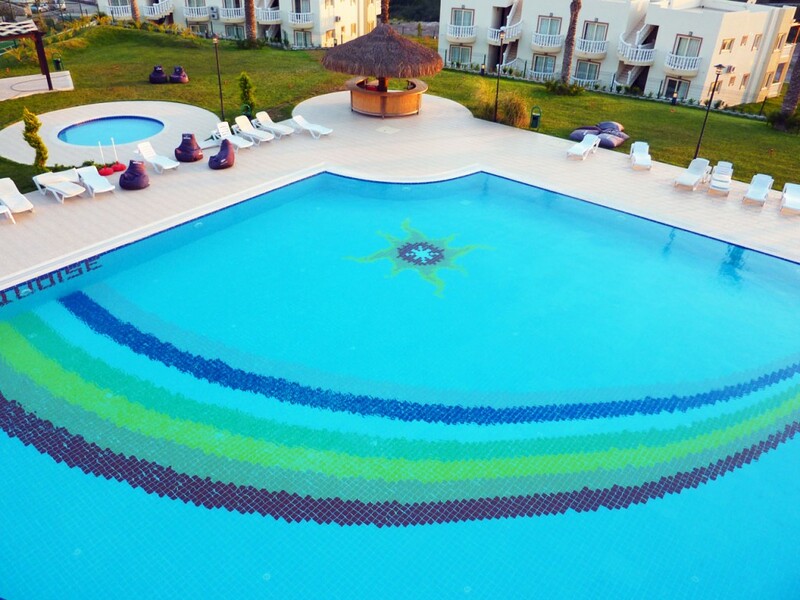 In Peak season the resort presents weekly Turkish entertainment and the BBQ’s are not to be missed and are a great place to meet fellow holidaymakers. When there isn’t a live show music is provided by DJ’s playing old and new tracks. The bar has a sports section so you can stay up to date with all the recent games on the big screen and also offers Free Wi-Fi so you can game or stay in touch with the family back home. This is where you will also find the open air cinema playing a popular film should you need your Hollywood fix whilst you are away. 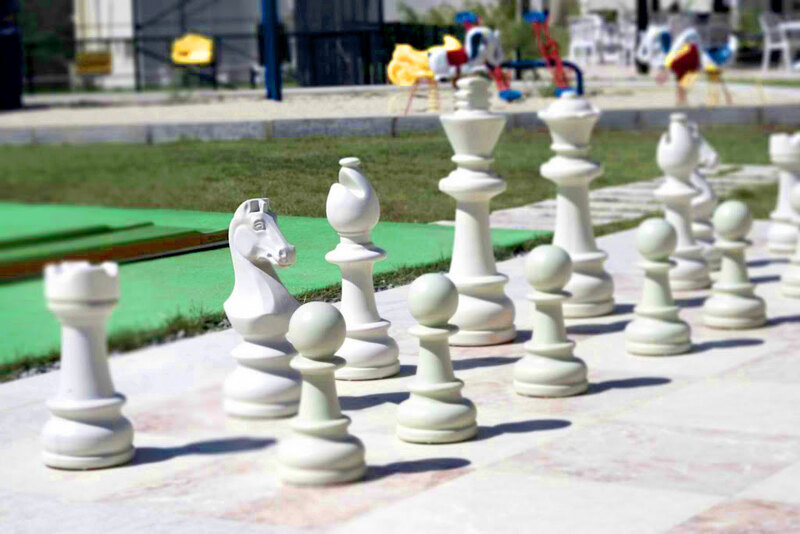 The staff at the Turquoise resort, understand that the majority of their customers are families and as such ensure there is plenty to keep the little ones entertained with waterslides, ground chess, children’s play area, tennis, mini golf, pool tales, and table tennis all being available for free. 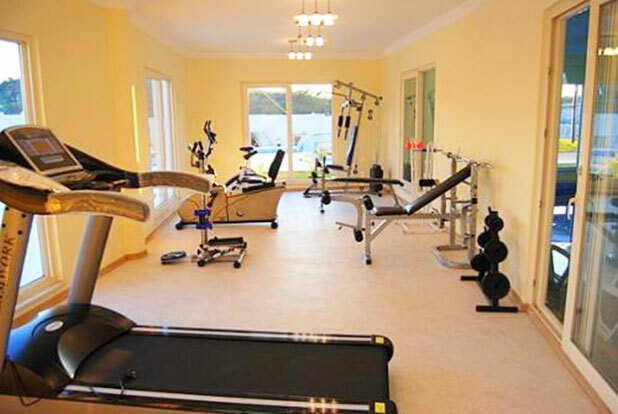 For those who want to keep fit or indulge in some pampering then there is an indoor and outdoor fitness centre, beauty spa with a wide range of treatments, massage parlour and sauna. 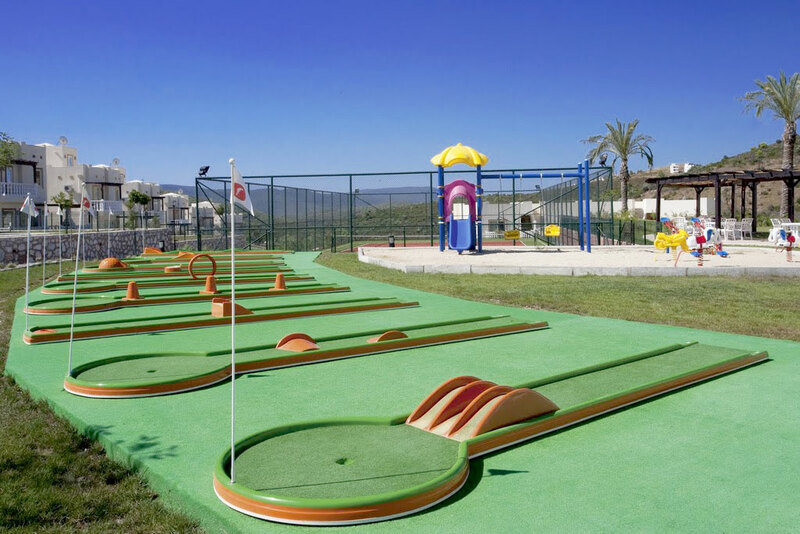 Keen golfers are spoilt with a chip and putt 6 hole golf course at the Flamingo Country Club resort and have the Vita Park Golf course just a 5 minute drive away that is host to two PGA 18 hole courses. For those who like to get their feet wet there are water sports at the resorts private beach club. This can be reached via the free shuttle or the resorts very own Monorail. The Beach Club, which is open from May until mid-October, offers drinks and food which you can take out on the jetty that sits over the sparkling sea or head back to your sun lounger. Supplies for your self-catering holiday can be found at the resorts on site mini market where you can pick up most essentials. 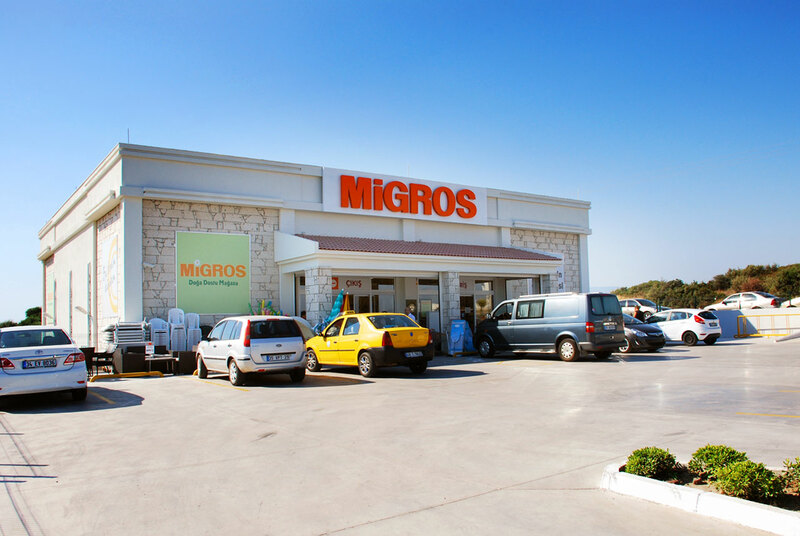 Outside of the resort gates and across the road is a fully stocked Migros supermarket where you will be able to pick up everything you need for your holiday. There is also a medical centre on site for any unfortunate bumps, bruises or illnesses. There is also disabled access with ramps to help get around the site for wheel chair users or those unsteady on their feet. If you need some ready cash then there is an ATM on the road to the Migros supermarket for you to use. You will find at the top of the resort a taxi rank as well as a Shuttle stop where the free local shuttles will take you to the neighbouring resorts, beach club, and other local eateries and beaches. A regular bus service will also take you into Bodrum for around £7 return. Other larger towns such as Bogazici are also serviced by bus routes if you don’t want to use a taxi. The buses operate from around 9am to 4pm from the resort. Guests at the Turquoise resort really will be spoilt for choice when it comes to where to go should they decide to leave the resort. Two local destinations are My Beach and the Sunset Café. The sunset café speaks for itself really. Should you want a relaxing drink with a nice meal as the sun starts to set then this is the perfect place to be. 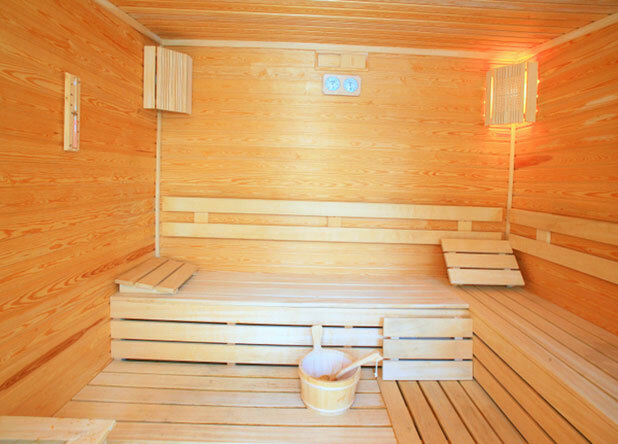 The atmosphere is relaxed and the service is friendly. This can be reached on foot from the resort. My Beach is a 5 minute journey from the Turquoise resort and is a little piece of paradise. 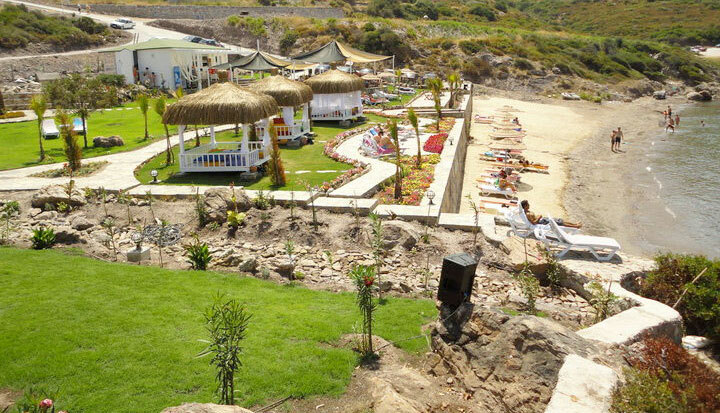 My Beach is set in a secluded bay where the shore gently slopes down to the Sea which is perfect for a swim. The waters are clear, calm and warm. My Beach has its own private manicured grounds and gardens. Dotted around these grounds and waterline are beach huts that have sun loungers and large scatter cushions on which to sit back and relax whilst your waiter brings your drinks and food. The views are amazing and should not be missed. There are lots of local villages all dotted along the coastline but if your time is limited then the two places to visit are Guvercinlik and Bogazici. Both have fantastic beaches, with superb waterline restaurants serving the catch of the day as well as buzzing markets where you can haggle to your hearts content. Go if: If you want to stay in a beautiful location with everything on your doorstep with plenty to see and do without having to hire a car. Avoid if: You plan on parting away until the early hours every night in different clubs and bars. To book an amazing Villa or Apartment on the Turquoise resort visit our Turquoise Resort Rentals right now to book an amazing holiday.